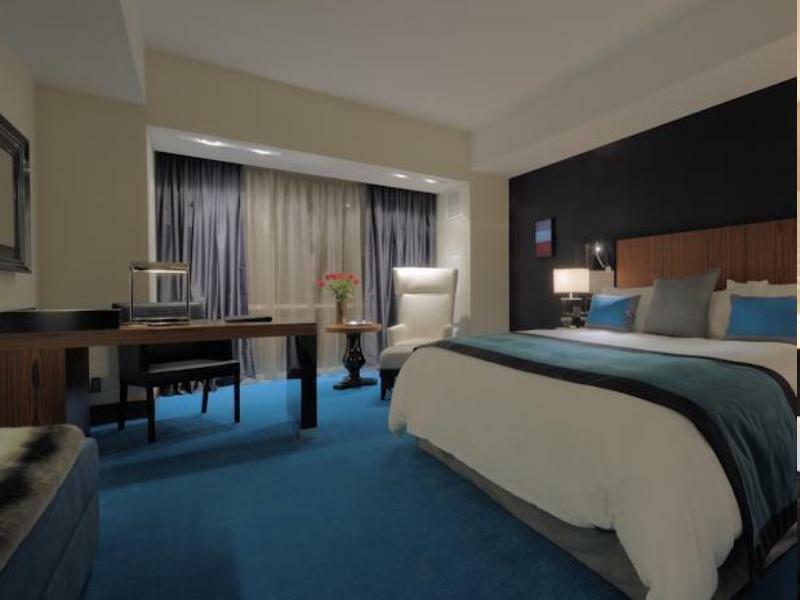 "All the staff was super friendly and helpful at the front de..."
Have a question for Radisson Blu Aqua Hotel, Chicago? "Top rooms give very nice view of the city." "Location near attractions helpful and attentive staff"
Well-placed in the sightseeing, restaurants, shopping area of Chicago (IL) city, Radisson Blu Aqua Hotel Chicago provides a most conducive spot for you to take a break from your busy days. From here, guests can enjoy easy access to all that the lively city has to offer. A haven of rest and relaxation, the hotel will offer total renewal just steps away from the city's numerous attractions such as Aqua Tower, Consulate of Canada, McDonalds Cycle Center. First-rate hotel services and facilities that define the Carlson Rezidor Hotel Group experience await you at the Radisson Blu Aqua Hotel Chicago. This hotel offers numerous on-site facilities to satisfy even the most discerning guest. 334 rooms spread over 18 floors provide a warm and pleasant home away from home. Modern comforts such as television LCD/plasma screen, carpeting, linens, mirror, towels can be found in selected rooms. Throughout the day you can enjoy the relaxing atmosphere of the hot tub, fitness center, sauna, outdoor pool, indoor pool. Radisson Blu Aqua Hotel Chicago is a smart choice for travelers to Chicago (IL), offering a relaxed and hassle-free stay every time. "I enjoyed my stay here." All the request I made at the time of booking as well as at the time of check-in were ignored. The response was a flat no, without any sorry or giving a reason for no. The hotel might be trying to create a cool atmosphere, but that does not mean the staff need to be cold-hearted without any hospitality mindset. Checked our bags in early so we could sight-see. Got pre-registered and then got a text when our room was ready, which was right on time. All the staff was super friendly and helpful at the front desk. I did a request for a bathtub room and got blown away at being placed in a corner unit, with beautiful windows all around. The bathtub room is highly recommended. Bathroom was luxury. Bed was so incredibly comfy. Lighting could be bright or perfect for ambiance. Room service food and restaurant/bar food were really impressive. Well-stocked mini-fridge. Balcony was so cool! The only thing I would have changed was for the room to have an empty mini fridge as well so people can store their own leftover food/drinks, or get a bigger fridge to accommodate the mini-fridge selection plus the option of customers to have their own space. Really was one of the best hotel experiences I've had. I enjoyed my stay here. Excellent service. Good location. Room is small. Bathroom sink plugged up for few days without notice by housekeeper and without fix. Good location and staff friendly. A good location; a rock festival was on-going when we stayed, which was no problem; however the hotel's response to apparently large numbers of people in the hotel was to demand hotel guests wore wrist bands ( a la a patient in hospital) to indicate their status as such. A stupid idea. Stayed four nights for business and pleasure. In the loop close to river and Millenium park as well as CBD. Great gym and two restaurants that serve all your needs. My only complaint is that my room had a huge pillar in it so you had to squeeze past it to get into bed. Otherwise the room would have been quite spacious. Location, comfort and friendliness of staff. It was wonderful when we stayed last year, so I booked it again this year. It did not disappoint on our second visit. From check-in to check-out the staff were friendly, efficient, patient, polite and knowledgeable about the city. We dined in the bar twice and shared a bottle of wine and flat breads in the lounge. Every time the wait staff knew the food and wine and were willing to make recommendations. The service was attentive without being intrusive. The room was very comfortable and clean. The Radisson Aqua Blu is now my first choice of hotel in Chicago. I made the booking 3 months in advance to secure a room. I would recommend it unreservedly for business or leisure travel. we wished we stayed where we usually stay. This hotel made them selves out to be 5 star, but the rooms felt like cheap, mass produced, Inner city apartments, that are rented out to people. Curtains were shabby, rooms lacked soul or ambience, and looked cramped. Felt like a 4 star hotel, and as such, we were disappointed with our choice. Staff where great however, and the bars, and restaurants looked great, however We won't stay here again. My room is on the first floor facing another building. There is no view what so ever. Only one front elevator worked the whole time I stayed (4 nights). The mattress needs to be changed since it was long over due. The room was clean, but certain areas, especially the headboard, were dusty. The shower host didn't work and the tiles on the floor in the shower stall were loosen. On the positive sides, the size of the room is adequate and quite. I was drawn to the hotel because of the building desig but thought the interiors were a bit too specific. The Bimini blue carpets and shiny surface treatments might have been cutting edge for about 15 minutes. The tile in the shower bed was not mortared properly and rocked when stood upon. Water was clearly getting under the tiles and it smelled like mildew. This issue was apparently wide spread throughout the hotel. Condensation from the windows pooled at the floor. Some of the rooms have wood floors and unfortunately that was the case with the room above me. Shoe noise from above woke me up at 5:30 am. Overall it felt as if more attention was being directed to image rather than the actual experience. Our stay at the Radisson was excellent. Couldn't really fault any part. Upon checking in the staff asked if we wanted to upgrade to business for our stay which was reduced to $40 per night (from the standard $75). We decided to do it and it was the best decision we made. The breakfast and evening drinks by far covered the cost. The concierge was very knowledgable and not pushy at all. The location was great, we could pretty much walk anywhere we wanted to go and if we couldn't there was a taxi rank outside. Used the gym every day we were there, it may have actually been better than our gym at home! So very happy with the stay, definitely a 5 star experience. Quiet hotel, great staff, comfortable beds! Excellent staff, excellent rooms, great location. Had a fantastic stay!